A transducer (probe) is a device that converts physical energy into and out. An ultrasonic probe converts electrical energy into acoustic energy and converts acoustic energy into electrical energy. The energy conversion is realized. Therefore, the ultrasonic probe is also called an ultrasonic transducer, which can be used for both transmitting ultrasonic waves and receiving, and is a key component in the ultrasonic ranging system. ultrasonic transducers mainly include mechanical ultrasonic transducers, electric ultrasonic transducers and electroacoustic ultrasonic transducers. 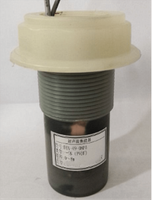 Among them, electroacoustic ultrasonic sensors are mainly composed of piezoelectric crystals (electrostrictive) and nickel-iron aluminum alloy (magnetostrictive). According to different designs, the shape of the ultrasonic transducer mainly has a column shape (the front and rear metal cover plates have the same diameter), a horn type (the front cover plate diameter is excessively reduced by the arc shape), and a column shape with a section in the middle. 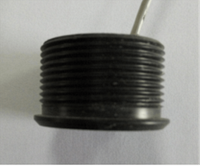 A piezoelectric ceramics transducer is an electroacoustic transducer that converts electrical and acoustic energy based on the piezoelectric and inverse piezoelectric effects of certain crystals. 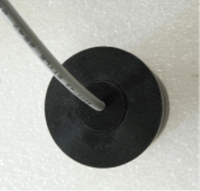 Piezoelectric ultrasonic sensors are mainly composed of piezoelectric wafers. The ultrasonic sensor composed of piezoelectric crystals is a reversible sensor that converts electrical energy into acoustic energy, and when it receives ultrasonic waves, it can also convert acoustic energy into electrical energy. Piezoelectric ultrasonic sensors operate using the resonance of a piezoelectric crystal. The structure of some single crystal materials has asymmetric characteristics. When these materials are subjected to external stress and strain, the internal lattice structure changes (deformation) will destroy the original macroscopic state of electrical neutrality, resulting in a polarized electric field. (electrochemical), the generated electric field (electrode polarization) is proportional to the magnitude of the strain. This phenomenon is called positive piezoelectric effect, which was discovered by the Curie brothers in 1880. Subsequently, in 1881, it was further discovered that such single crystal materials also have an inverse piezoelectric effect, that is, when a material having a positive piezoelectric effect is subjected to an applied electric field, stress and strain are generated, and the strain and the external electric field are formed. Just proportional. Experiments have shown that the piezoelectric effect and the inverse piezoelectric effect within a certain limit are linear. That is to say, in the piezoelectric effect, the surface charge density of the piezoelectric crystal is proportional to the magnitude of the strain. When the strain changes the sign, the charge also changes the sign. In the case of the inverse piezoelectric effect, the piezoelectric crystal strains under the action of the external electric field. The size is proportional to the electric field strength, and when the electric field is reversed, the strain is also reversed. Piezoelectric transducers are devices that convert electrical energy and acoustic energy using the piezoelectric effect of certain single crystal materials and the electrostrictive effects of polycrystalline materials. Because of its high electroacoustic efficiency, large power capacity, and the structure and shape can be designed according to different applications, it is widely used in the field of ultrasound. Ultrasonic piezoelectric transducers are divided into single probe and dual probe. The single probe mode refers to an ultrasonic proximity transducer that is used to transmit both ultrasonic waves and ultrasonic waves, that is, the probe is used for both transmission and reception. In the single probe mode of operation, when transmitting ultrasonic waves, it is necessary to apply a voltage of more than ten volts, several tens of volts or even hundreds of volts to the probe to cause mechanical vibration of the probe. This mechanical vibration passes the vibration of the piezoelectric wafer to mechanical energy. Converted to acoustic energy to excite ultrasonic waves. When the ultrasonic wave is received, the aftershock generated by the ultrasonic wave does not disappear immediately, and the amplitude of the transmitted signal is more obvious than the amplitude of the echo signal, so that the receiving end mistakenly generates the wave generated by the vibration as an echo. Measurement errors affect the accuracy of the ultrasonic distance measurement sensor. The conventional practice is to stop the transmission, delay the period of time, avoid the time of this aftershock and start receiving echoes, which leads to the blind zone. The dual probe works by sending two ultrasonic waves and receiving ultrasonic waves using the same probe. From the level of the single probe blind zone analysis, the dual probe mode of operation can completely eliminate the blind zone and increase the measuring distance. However, in practical applications, because the distance between the transmitting probe and the receiving probe is small, and the sound wave is diffractive, the wave emitted by the ultrasonic transmitting probe may not be reflected by the obstacle, but directly bypasses the receiving probe, resulting in the positives, therefore, the blind zone is still there. 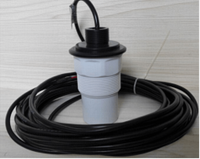 The ultrasonic range finding sensor is a sensitive component of the ultrasonic liquid level sensor, which uses the piezoelectric effect and the inverse piezoelectric effect to complete the conversion of electrical energy and mechanical energy (sonic vibration). Choosing the right piezoelectric transducer is the primary task of making ultrasonic instrumentation. The following parameters need to be considered: the voltage value of the piezoelectric transducer, the beam angle, the resonant frequency, the dead zone, and the echo sensitivity.